The classic Hollywood studio melodrama based on a popular Fanny Hurst novel notable for breaking Hollywood's early racial barriers is still a surprisingly powerful film. The story of two women – one black, one white – and their bond of friendship and family over 20 years was popular and critically acclaimed in its day, so much so that it spawned a successful remake in 1959 with Lana Turner. It's a film about time and place, and so with today's eyes the stereotypical characterizations could be seen as offensive. But at the heart of the story is a searing emotional drama about racism and female empowerment that in 1934 was decades ahead of its time. Claudette Colbert plays Bea Pullman, a widow with a young daughter, Jessie. 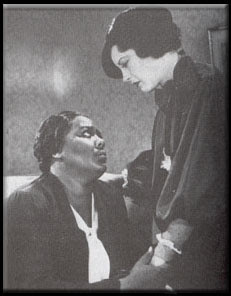 When she meets Delilah (Louise Beavers), a black woman who is also widowed with a child of similar age, they quickly strike up a friendship of commonality. Delilah offers her services as a maid in exchange for room and board. Bea and Delilah soon go into business together and open a pancake restaurant featuring Delilah's secret pancake recipe (influenced by the Aunt Jemimah brand). Bea's career aspirations outpace her pocketbook, but that doesn't stop her from negotiating her way into buying and renovating a vacant store on credit. Over the course of many years the store expands into an internationally successful business making Bea and Delilah rich. But Delilah honourably retains her modesty and continues to serve Bea as her maid. Despite the success, Delilah's relationship with her daughter Peola becomes strained. Peola was born with light skin, which appears as white. Throughout her youth Peola experiences racist contradictions and embarrassment about having a black mother. In her teenager years it becomes so extreme that she leaves home to start a new life with a new identity, never to see her mother again. These plot threads when written out and described seem more like daytime television than respectable cinema, but the story is never sensationalized. Director Stahl and his writers never give their characters a helping hand. In a series of scenes, we watch Bea's guile and business-savvy in building her business from scratch. Bea and Delilah, despite all their family hardships and personal struggles, never stray from their personal ethics. Though the film was made 25 years before the Civil Rights movement, it’s as liberal and empowering as anything to come out of that era. At a glance, Delilah can be seen as a stereotypical black maid, as she is referred to as "Mammy" and speaks with a tongue now seen as racist. But she is a powerful figurehead for honour, stability and strength of character – elements much stronger than her stereotypes. Delilah's final moment as she calls out for Peola is one of the most powerful images I've seen in film in a long time. The simplicity of her needs and emotions reminds me of a John Ford film, and when Peola is reunited with her mother it’s a heartbreaker. The Universal DVD released a few years ago also contains the Douglas Sirk 1959 Technicolor version with Lana Turner. It's an interesting comparison – specifically because it was made 25 years after the original. Bea's character (renamed Lora) is put ahead of Delilah's character (renamed Annie). Sirk's film is more in line with his other 'women's melodramas', such as All That Heaven Allows and Written in the Wind. It retains the empowerment of the female lead, but the statement against racism and segregation is less powerful. The 1934 version is by far the better film.